From Sassicaia's San Guido Estate this Super Tuscan second label offers a lot for the money! 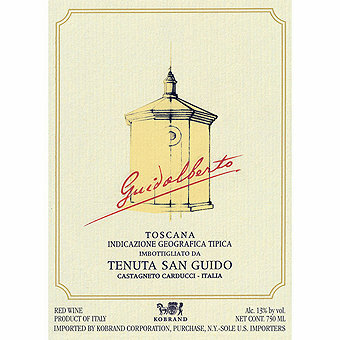 Sassicaia's little brother, Guidalberto is a lush Super Tuscan from the Tenuta San Guido in Bolgheri. A blend of 60% Cabernet Sauvignon and 40% Merlot, fermentation takes place separately for each variety in temperature-controlled steel vats before undergoing maceration. The wine is aged 15 months mostly in French oak. This is the wine to drink and enjoy while you wait for your Sassicaia to mature in your cellar. This 2016 has received excellent reviews. The Wine Advocate scored this 94+ points saying "This wine is showing exceptionally well in this classic vintage. The 2016 Guidalberto (Cabernet Sauvignon and a smaller percentage of Merlot) opens to a full and generous bouquet and a beautifully rich and velvety appearance. 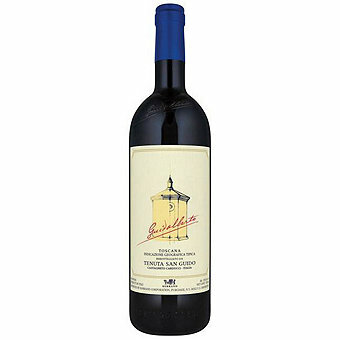 This edition of Tenuta San Guido's mid-level wine offers a bigger aromatic profile, more texture and more volume as well. Dark cherry and blackberry segue to spice, tar, leather and sweet fruit at the end. The mouthfeel is elegantly shaped, silky and nuanced. This may well be the best vintage of Guidalberto I have yet to taste—and you can get this wine at a great price too." and James Suckling scored it 95 saying "This is extremely perfumed with aromas of lavender, cinnamon, blackberries, bark and blackcurrants. Full-bodied, extremely refined and polished. Gorgeous fruit and balance. Best ever bottling of this pretty wine from the producers of Sassicaia? Drink or hold."